Beat the competition in the comfort of your own home with the quality Carmelli™ Dual Electronic Basketball game. 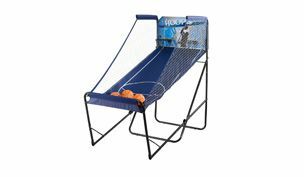 Unlike other basketball games, this game is built to last with a rugged steel frame and a durable wooden backboard. The LED infrared electronic scoring units above each hoop ensure accuracy while the electronic timer counts down game time. This basketball game will provide hours of fun for the whole family. When not in use the unit folds for easy storage.